If you've been reading the Unusual Historicals website this month, you have probably noticed a commonality between all the authors who post here. Sure, some of us write about Celtic Britain, some favor Medieval Spain, and others, like me, set their books all over the map. But one shared attribute is that we all, in our strange way, love to do research. If we didn't, you can bet we wouldn't spend our vacations dragging our significant others through dusty archives and to obscure historical sites in order to take pictures of grass-covered ditches. Some of the best research is the kind we perform ourselves: physically going to the location that we write about and absorbing, first hand, the experience and sensations of place. A few years ago, in preparation for a historical novel which I am currently writing, I traveled to several National Trust homes in England that offered access to the servants' quarters and kitchens. Unfortunately, travel can get pretty expensive and it takes a lot of time. That means that the majority of the research has to be done through the internet or, even better, via books. Lots and lots of books. Some books can be found at libraries (especially university libraries), but eventually, the avid researcher is going to create her own research library. Ask my husband: whenever we travel, I invariably find my way to a used bookstore and pour through the shelves, searching out the perfect, obscure out-of-print tome about 18th century fencing academies. He patiently carries armfuls of books as I ransack the shop. But once the books are paid for and hauled home comes the next, crucial step: storing and organizing them. I'm a firm believer in the principle of organization. If I have to search all over the house for the book about Roman prostitutes, I waste time and could lose valuable threads of inspiration. If I have a place for everything, and everything in its place, then I can zip right to the book I need and move on. Great theory--but theory isn't practice. For many years, my research books were scattered all over the house. 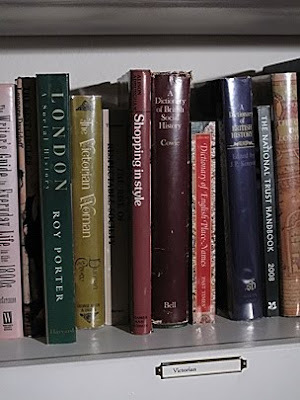 I had some culinary history books here, some there. Books stacked up on the floor next to my desk. 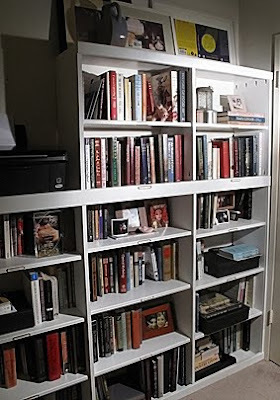 Books in boxes stored in closets. Books everywhere but where I needed them. When I finally was able to write full time, my husband looked at this "system" and vowed to do something about it. Reader, never let it be said that romance novelists lack romance in their own lives. Sure, my husband isn't a spying duke or aristocratic pirate, but he's hero material all the way. He built me a custom bookcase to hold my research library. Could anyone ask for a more swoon-worthy guy? I don't think so. I direct your attention to these photos of my research library. Now my piles of books have somewhere to go. Each shelf has been organized and labeled. Shelves for Victorian books. 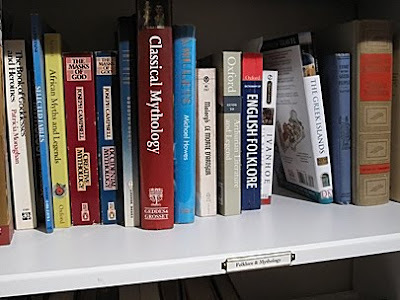 A shelf for Folklore & Mythology. Social History. Science & Technology. It's a research dork's dream. I also have boxes holding loose papers and photocopies. I turned to my research library many times whilst writing my upcoming novella, "The Undying Heart," to learn more about the Crimean War, as well as information about military uniforms of the 1850s and the telegraph. What a relief to know that the knowledge I needed was right beside me the whole time, so I could focus not on hunting down the books but on writing about undead soldiers and the women who love them! Granted, the bookcase doesn't hold all of my research materials. There just isn't enough room in my office to hold them all. The Food History section extends to the bookcases my husband put in the dining room. There are books about the History of Jazz and Los Angeles in the hallway. And my theory texts, left over from grad school, linger in the living room. It's a fair assessment to say I have books in every room of my home. But my pride and joy stands right beside my desk, shelves laden with information. It has room to grow, yet somehow I know, given my insatiable appetite for books and research, that the shelves will soon fill and my wonderful, handy husband will build me yet another bookcase. Because I'm that kind of research glutton and because he's that kind of hero.